By Environmental Assessments Consulting based in Sarasota, FLORIDA (USA). By City Analysts Ltd based in Dublin, IRELAND. By Aqua Science Engineers, Inc. based in Irvine, CALIFORNIA (USA). By Remediation Risk Management, Inc. (RRM) based in Santa Cruz, CALIFORNIA (USA). These assessments include the full range of services needed to evaluate potentially contaminated properties through: Phase I environmental site audits. Soil and groundwater sampling and laboratory analysis. Report preparation & certification. Communication with local, state & federal agencies. Enalytic inherited over 30 years of field service experience from other laboratories in environmental sampling. 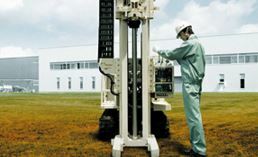 Enalytic’s field technicians can customize a sampling plan to suit your needs. By Sadat Associates, Inc. based in Trenton, NEW JERSEY (USA). Well testing takes on three forms and the Water Resources team can provide you with options for all three. By Ketek Group Inc based in Edmonton, ALBERTA (CANADA). WaterFind uses seismic technology (EKS)to conduct on site surveys on properties to locate groundwater (well water) in aquifers and provides reports as to estimated depths and interpreted yields and the viability of obtaining well water at selected sites for water well locations before having to go thru the expense of drilling. By WaterFind Inc. based in Longview, ALBERTA (CANADA). McLorinan Consulting have over 20 years experience in contaminated land assessment. By McLorinan Consulting Ltd based in Mallusk Drive, UNITED KINGDOM. By GreenSmith, Inc. based in Evanston, ILLINOIS (USA). By EARTH Consulting, Ltd. based in Cleveland, OHIO (USA). By Campbell Environmental Group, Inc. (CEG) based in Falmouth, MAINE (USA). By Terra Nova Environmental Services LLC based in Trenton., NEW JERSEY (USA). By Environmental Profiles, Inc. based in Columbia, MARYLAND (USA).